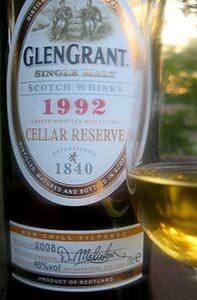 Back in February I’d posted a review of a Glen Grant 23, 1985 and said I’d have more Glen Grant reviews in the weeks to come. Because I am a shameless liar I only posted one more Glen Grant review in the roughly 20 weeks that came after that. But what is time? An illusion, a fog. Here we are now in mid-July and the weeks fall away like magic and we’re returned to that halcyon time when all three people who read this blog regularly were agog at the thought of successive weeks of reviews of Glen Grants that are no longer available and were only available in Europe to begin with. See, dreams can come true. 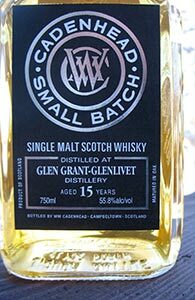 Those who are disappointed that I am not reviewing very many whiskies these days will be thrilled to see that this week’s review is of a Glen Grant that was released in the Netherlands almost nine years ago. 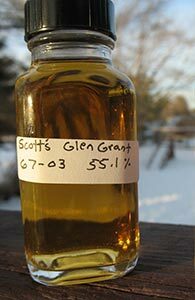 I will have some more recently released Glen Grants in the weeks to come—I recently hosted a vertical tasting of Glen Grant for members of my local tasting group—but I’m starting with this bottle which I’ve been dipping into regularly since I opened it. It’s been a while since I’ve reviewed a bottle from Archives, the excellent series from the Whiskybase shop which almost always provides good value; and so let’s go back to a bottle from their “First Release” (though if I recall correctly, this wasn’t actually their first release—it was preceded by an “Inaugural Release”). As with the Glencadam of similar age and vintage that I reviewed last month, this bottle is another reminder that just four years ago it was possible to purchase bottles of very old whisky of high quality for less than $200. And you didn’t have to be in a huge hurry either—I didn’t buy this as soon as it came out: I waited till reliable reviews of it were available. I’m sorry if the above seems like a tiresome refrain. It just seems worthwhile to constantly remind ourselves of how much pricing has changed and in how short a period of time. Gordon & MacPhail do a number of “licensed” releases under these old-style labels (I put “licensed” in quotes here because while I’ve seen a number of references over the years to these as licensed bottlings, I don’t really know what that means in this context). The distilleries that most often show up in this general livery in the US these days are Mortlach, Strathisla and Glen Grant. Actually, I don’t know if they still show up steadily or if the bottles I see from time to time are old stock, as G&M don’t put bottling or vintage dates on most of these bottles. They also don’t bottle them at a very high proof: many of them are at 43% or below—nor do I know if the colour is natural. This one is at 40%. I’ve been tempted by it for some time but when a local retailer marked it down late last year I was finally unable to talk myself out of taking a flyer on it. Well, I am glad to say that it did not disappoint. This Glen Grant 17 is from Whiskybroker the low-priced indie outfit of Martin Armstrong, the son of Raymond Armstrong, who was till recently one of the principals behind the revived Bladnoch distillery. 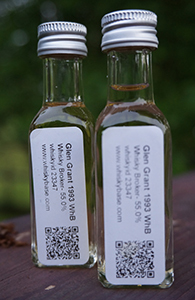 Bladnoch’s fate continues to be unclear but Whiskybroker seems to be going strong. More power to them and their reasonable prices—though I have to say I have not been very highly impressed by many of their bottles that I’ve tried (I did like this Bowmore more than the others). Let’s see if this Glen Grant bucks the “trend”. This ancient Glen Grant from Scott’s Selection is for me one of those stories that every whisky geek whose reach exceeds his or her bank balance’s grasp knows well. I saw it for years on shelves, listed at prices that were then past my comfort level (well past for whiskies on which little information was available), and passed. Now those prices are not entirely out of the question for me but I no longer see it on shelves. So when a friend offered me a sample I was partly hoping to have my initial qualms vindicated. But, as you’ll see, that did not turn out to be the case. Bloody hell. Glen Grant, as I’ve said before, is one of the storied distilleries that I don’t know very well and so I’m always happy to try another one. I have a review scheduled for next month of a much older, sherried one from an earlier era but first, here’s this bourbon cask teenager from the late 1990s. I’ve liked all the Cadenhead’s Small Batch releases I’ve reviewed in this run–some more than others–and I hope this will keep the positive streak going.